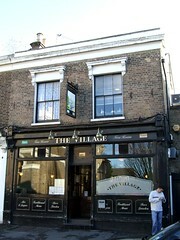 A pub in the 'village' area of Walthamstow, which was in the 2007 Good Beer Guide but not the 2008 one. This is a pleasant, more or less unrefurbished locals' pub with a welcoming atmosphere. The bar area and surrounding room is spacious and gets plenty of light, carpeted, but with tables around the room and some banquette seating by the front windows. There is a cosy little snug at the back of the room, down some steps, where children are permitted before 6:30pm (they are not allowed in the main bar area). There's also a reasonably sized beer garden area. There are five handpulls for ale, with Old Speckled Hen, Bass (£1.35/half), Bombardier, London Pride and Greene King IPA on a January 2009 visit (though the last was off). Sunday roasts are offered, with four options (beef, pork, lamb, vegetarian) at £7.75 each. Ewan's vegetarian roast included a perfectly tasty quorn fillet with cheese, accompanied by the usual suspects (Yorkshire pudding was good, as were the peas, cabbage and broccoli, roast potatoes were fine, though the carrots were a bit tasteless), and was just what was needed at the time photo. A quiz is advertised on Tuesdays at 8:30pm. Entry is £1.50 per player. Accessibility: Two steps to enter, but toilets are on the same level as the bar. Last visited by Ewan and Jo, 18 January 2009. Opening hours taken from the 2007 Good Beer Guide. Last edited 2013-05-10 08:12:54 (version 10; diff). List all versions. Page last edited 2013-05-10 08:12:54 (version 10).